Once more, it was Pakistan who had the centurion, while Australia walked away with the victory. 's career-best score of 130 went in vain as Australia secured what was in the end a fairly comfortable 20-run win, their eighth on the bounce. It was set up by the batsmen, the top four all registering half-centuries as Australia exploited Pakistan's sloppy fielding and uninspired bowling performance to plunder 327, the biggest total of the series. Targets in excess of 300 have only ever been chased successfully once in 26 times in the UAE, and despite Pakistan's valiant efforts, they would not be adding to that statistic today. From the moment Haris was dismissed, the result looked inevitable, with Pakistan eventually finishing up on 307. 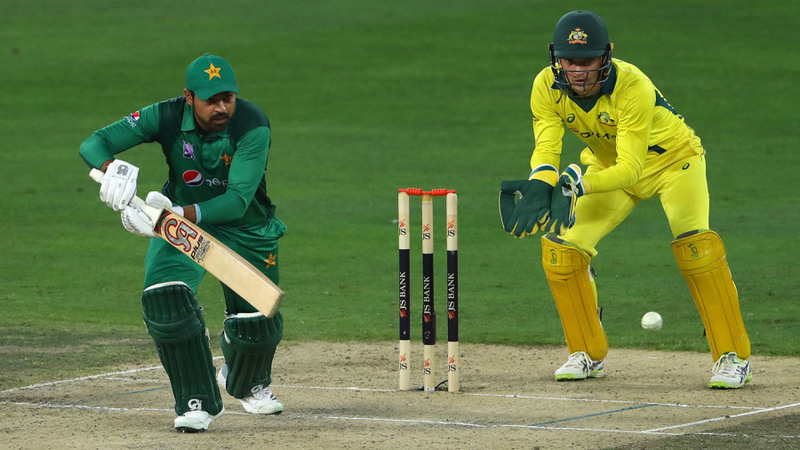 The chase began inauspiciously with Abid Ali, passed fit to open after a nasty shoulder injury had forced him off the field during Australia's innings, nicked off for a first-ball duck. It was a sharp lesson that in Pakistan cricket, there's very little space between extreme highs and crushing lows; in the fourth game, he had made Pakistan's highest ever score on debut with 112. Shan Masood and Haris consolidated well, however, taking control of the innings during the Powerplay as they kept pace with Australia. It was only after Masood was trapped in front by Adam Zampa, breaking a superb 108-run partnership, that Pakistan struggled to find a reliable partner for Haris. Mohammad Rizwan fell early, thanks to a superb catch at mid-on from Nathan Lyon off Glenn Maxwell, who played nearly as important a role with the ball as he had with the bat. With Umar Akmal, Haris put on another century stand; this one tallied 102. Umar displayed a maturity that has been absent from his game for much of his career, rotating the strike and finding the odd boundary when the opportunity allowed. Haris appeared to be playing on another pitch altogether, so assured was his footwork and so extravagantly confident his strokes. Despite their pluck, however, it never looked sustainable, and the fact Pakistan have a long tail must have played heavy on the minds of the pair. Ultimately, Umar fell in predictable fashion, his patience finally deserting him. With the required rate approaching nine, he charged Nathan Lyon, who was experienced enough to drop the ball short. Nowhere near the pitch, he went for the heave anyway, sending it more up than away. Jason Behrendorff at long-on actually had to charge in from the boundary to complete the catch, and the clean sweep was looking ever more assured. Four balls later, Haris guided one from Kane Richardson straight into backward point's hands, and from thereon it was just Imad Wasim thwacking a few to try and make it as tight as possible. It was an entertaining cameo, Pakistan's stand-in captain scoring a breezy 34-ball 50 to keep Australia honest right to the end. But with support dwindling from the other side, the percentages were always in Australia's favour, and all Pakistan could manage was the consolation of their highest total of the series. As has been a reliable pattern over the past four games, the tone of the game was set by Australia's openers, a 134-run stand between Aaron Finch and Usman Khawaja paving the way for the big total. Just like Maxwell had done in the last game, Khawaja fell two runs shy of yet another ODI hundred. Even so, it was his fifth score of 88 or more in his past seven innings, and the supporting cast of Finch, Shaun Marsh and Maxwell did their jobs; all got half-centuries. Pakistan won the toss for the fourth time in five games, and seeing how close they had come previously, Imad opted to field again. To restrict Australia, however, they would need early wickets, and with the form both Finch and Khawaja are in, that was no easy feat. Pakistan's lackadaisical fielding efforts didn't exactly help build pressure, and the incoming Mohammad Abbas - brought in to regain the control Mohammad Hasnain had lacked - had the opposite effect. Once Khawaja got him away for a pair of boundaries in the fifth over, Australia were away, and Finch's lofted six off Abbas' following over indicated their fearlessness against Pakistan's bowling attack. Imad began with a maiden, but so poor was Pakistan's ground fielding it was hard to see how it would complement the bowling. Turning ones into twos is a good skill to have, with the proviso that you need to be the batting side. In the field, Pakistan were continuously guilty of this magnanimity, with Umar Akmal and Yasir Shah just two of the more notable repeat offenders. There weren't any catches grassed, but then again, Finch and Khawaja didn't so much as allow Pakistan a sniff for the first half of the innings. With time to seal a World Cup slot running out, Usman Shinwari could not have made a better final impression this series. He allowed just 14 runs in his first five overs, taking the wicket of Finch through nothing more than raw pace and a hint of seam movement, rushing him into a shot which never made contact. He was also the man to remove the other opener, again using his tearaway pace as the ball climbed onto Khawaja, who had become noticeably edgy as he approached his hundred. Bowling at the death might not have helped Shinwari's figures, but he still finished with 4 for 49 in his ten overs. Maxwell was predictably explosive, given a perfect platform by the top order. Once more, however, he could have walked back early. Off the first ball of his innings, he helped Shinwari to fine leg, where a horrible misjudgement from the fielder saw the ball sail over his head and for a boundary. He would make Pakistan pay for it again, something Pakistan caught wind of when he smashed Yasir Shah for three fours in the following over. In what seemed like minutes, he had had brought up a 26-ball fifty. There was still time for a four and a six off Haris before Junaid Khan finally knocked back his off stump for a barnstorming 70 off 33. With ball in hand, he would return figures of 1-45, to finish far and away the standout player of the match. Pakistan may walk away from this series with a few positives; they will wish they were walking away with at least one win too.